Phil Hendrie & myself. I asked him if we could do deadpan, and he more than complied. Oh oh, oh oh oh--I heard something profound the other day. It's probably a good idea to write down the things that are profound to you, as this helps you encode and solidify them into your long-term memory. I'm not a doctor or scientist, though, so don't believe what I'm saying. Just file it in the "interesting things I've heard that I need to research & verify if they are backed up by hard science" drawer. So I was listening to the WTF podcast (and lately, podcasts are all the cultural input I am taking in) and Marc Maron did a re-air of his Gary Shandling interview because Shandling died last week. So it was a wonderful interview and Shandling sounds like a wonderful, thoughtful, understated and offbeat personality (much how I imagine my ideal self, which may bear little to no resemblance to my actual self, mind you). Maron mentioned that he had (or almost had) an opportunity to play basketball with Shandling in Maron's early days as a comic. But Maron expressed something like relief that it didn't happen, because he would have been extremely nervous to meet Shandling, and what if he didn't like him, etc. And Shandling, without missing a beat, said, "well why would you have treated it like that? Yes, you would have been weird if you approached it like that--why wouldn't you have just treated it as 'This is just another life experience'?" So that stands on its own and needs no further elaboration. Feel free to stop reading here. What follows is only my reaction to that statement. You're still here? Ok, good, I hoped you would stay. I only said you could leave because I was worried that's what you secretly wanted to do, and I don't need your charity. Yes, I'm outing myself as incredibly needy, but if you didn't already know that then you weren't paying attention. It spoke to me because this is me in most of my life. Instead of living my life as it comes to me, I negotiate my life from a distance. If I have a big moment coming to me I will endlessly analyze and strategize, and otherwise plan for scenarios that could never hope to play out. A few examples: I went to an author reading with Chuck Palahniuk, the guy who wrote "Fight Club." I wrote him a letter, that included my email address with a hopeful plea for response, and slowly slipped it across the table to him when it was my turn for my 26 seconds and a signature. 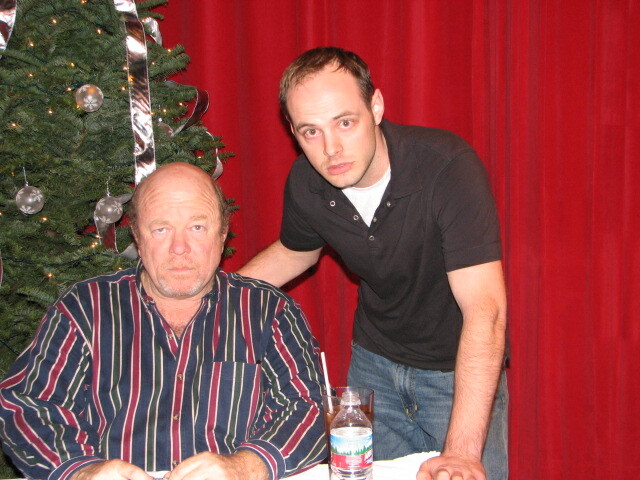 Next: a radio host that I listened to religiously, Phil Hendrie, was doing a listener event in LA. So I flew there, slept in the rental, then went to the show. It's not weird to go to the show--it's weird that I had built up this otherworldly expectation that Phil was going to recognize me for the special human that I am, connect and bond with me. Then probably offer me a job, or announce that I was his heir apparent to his massive stash of talent and audience. Did I really think that was going to happen...no...kinda...kinda yes. I was helped out of this trap, somewhat, by an interview that David Foster Wallace gave, where he and his interviewer talked about those unfortunate people who show up to readings expecting more, expecting a relationship to form, or at least a deeper conversation to take place. And their comment was that a book signing is not a space designed and set up to foster such a possibility for anything other than quick chit chat. So that was very helpful--and this Shandling comment just pushes me that much more down the road to normalcy. It's a road whose end I won't reach, but it's nice to make a little progress. The message: Stop trying to engineer these moments--just take what the world is offering you, and respond proportionally. "[T]heir comment was that a book signing is not a space designed and set up to foster such a possibility for anything other than quick chit chat ... this Shandling comment just pushes me that much more down the road to normalcy ... The message: Stop trying to engineer these moments--just take what the world is offering you, and respond proportionally." Bah. That may not be your destiny. Wallace and his interviewer, if you want to know my opinion, sound like a couple of stuffed shirts. How are they the final arbiters of the function of a reading? People trouble to honor the readings with their attendance, and get the law laid down for what they have the right to expect? Poo. I'll tell you something. I never read anything by Wallace, but I just finished reading your wonderful creation on mallard ducks. It set me up perfectly for today's segment of life, and thank you! Could you have written that wonderfully goofy thing if you'd gone "more down the road to normalcy"? Just found your website a short while ago, and I'm enjoying it greatly. Looking forward to reading more of it. Wow, well this is 3 months late, but better now than never--thank you for the incredibly thoughtful response. I can't argue with anything you said--which is why I so frequently end up arguing with myself.